Vantage Gem: Not so little? Clever stuff, to fit a generous forward lounge, a decent kitchen and full washroom facilities into a van conversion that’s only some 5.4m long. But that’s what the appropriately named new Gem from Vantage offers – in a layout like no other. Well engineered seat bases may not be designed for passenger-carrying, but that hasn’t stopped Vantage giving them metal framework. 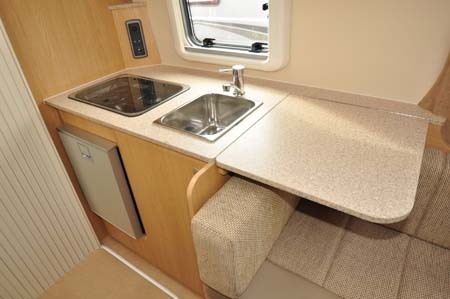 It certainly makes things as easy as possible when it comes to accessing the underseat storage as well as sliding out the extensions if you want to switch from two single beds to a double. 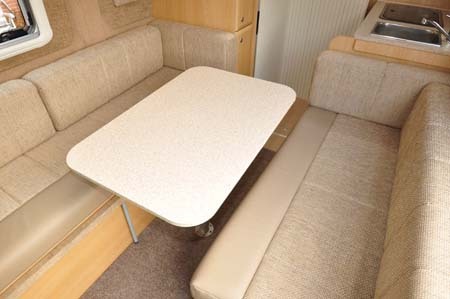 All-important dimensions here are a generous enough 1.87m x 0.91 (tapering to 0.76m) for the singles, which also used the swivelled cab seats; or the transverse double, using just the lounge cushions, 1.87m x 1.83m. All this still leaves the back end free, where the kitchen and washroom share floor space – that’s because the latter is created by drawing round a full-height tambour door. Then, if you want to shower, just remove the inset floor panel to reveal a shower tray mid-‘van. It certainly works as a way of creating space – the only disadvantage being you can’t use the kitchen and washroom at the same time. But you certainly get all the facilities. Apart from the water-saving trigger-operated shower, there’s a small flip-down washbasin over a bench toilet from Thetford. The kitchen may only stretch to a two-ring hob for cooking, but you do get a compressor fridge, a decently deep sink, worktop extension and quite a lot more storage than you might expect. 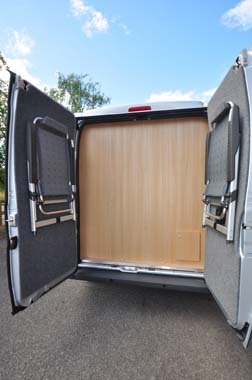 Walk round to the back of the vehicle and the blanked off area beyond the washroom/kitchen leaves just enough space to keep mucky items such as the mains lead, leveling ramps, dirty footwear even, as well as hanging hooks for outdoor chairs on each door. Other facilities of note are the fresh and waste water tanks of 70 and 50 litres respectively, twin 105aH leisure batteries with solar panel and an underslung 25-litre gas tank (with full on-board isolation) – all of which help make this Vantage a viable proposition for off-grid camping. But, there’s also lots of impressive detail here. The furniture has a rock-solid durability to it, abetted by foil-wrapped locker doors that are almost impossible to damage, high-grade hinges, sturdy fresh and waste water outlets. And then there are the things you can’t see. Top of this list has to be the insulation used by Vantage that also acts as a more-effective-than-most sound deadener – you’ll notice the different at the test drive stage, although again the quality of the fitting-out to the interior makes a difference here, too. Ditto the extra leaf specified for the rear suspension. 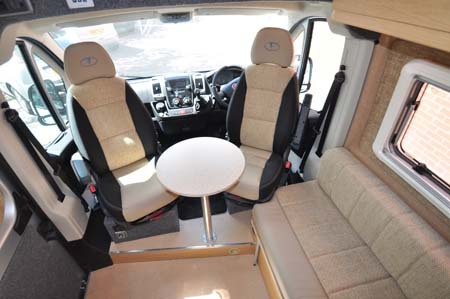 Prices start at a competitive £44,950 – that’s when using the Citroen Relay base. 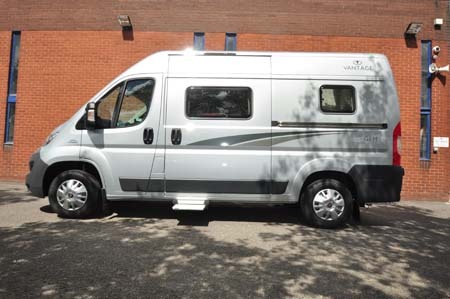 Admittedly, it comes out of the same factory as the Fiat Ducato, but the early suspicion is most folk will be happy to pay the £3,000 premium for the latter, with its more refined engine. We’ll see. 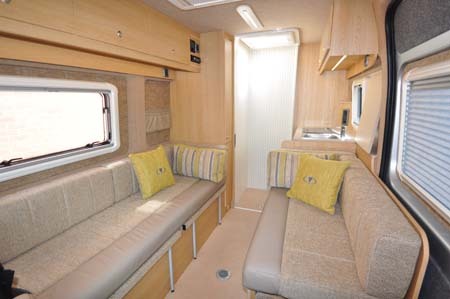 As a manufacturer, Vantage has plenty of rivals in the van conversion sector. Some offer broadly similar layouts, but invariably they’re in the next size up base vehicle. Sure, there’s some washroom and kitchen compromise here, but this is something a little bit different. There’s a good choice of base vehicle specification, but Vantage policy is to offer just the one exterior colour – metallic silver. Not only does this help with production, it also means Vantage can keep up a steady supply of base vehicles (and hence conversions) – so there are less excuses for delayed orders. A long-term adherent of selling direct, buying your Vantage will entail a trip to their rather impressive manufacturing and retailing base in Leeds, with a highly detailed handover that includes an insistence you spend at least your first night away on a local campsite! There’s more information on the Med on the Vantage website (www.vantagemotorhomes.co.uk). To find out more about our low-cost premiums visit the motorhome insurance discounts page.